The right combination of colorful cushions, your personalized message and pressure treated yellow pine wood combine to create your customized LuxCraft Rollback Glider. Accent your outdoor space with a relaxing glider to cradle you and loved ones in comfort as you take a break from your busy day. We offer a personalization option for this pine glider. Commemorate a special date, or dedicate your glider to a special person with your own personalized message. Simply select the personalization option and one of our Amish Furniture Specialists will call to discuss what you would like to see on your glider. 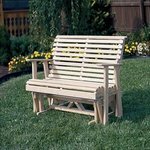 Your pine glider is handcrafted by Amish craftsmen in Ohio and is made from pressure treated kiln dried yellow pine. This select pine wood is best as it resists cracking, warping, insect damage and decay. 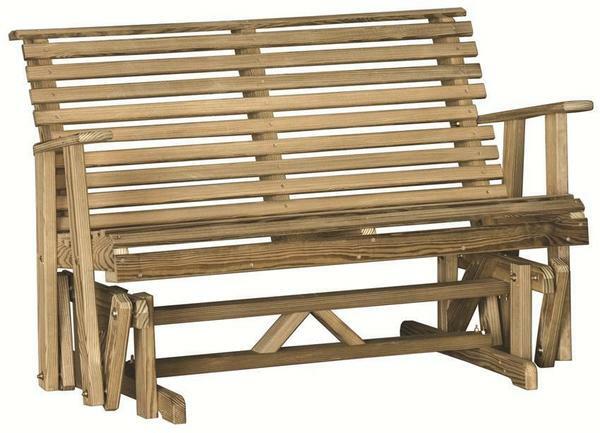 Be sure to review our lovely line of Outdoor Benches to enhance your outdoor scene. Call one of our Amish Furniture Specialists today at 1-866-272-6773 with any questions. All feature a new convenient flip-down center console with cupholders.